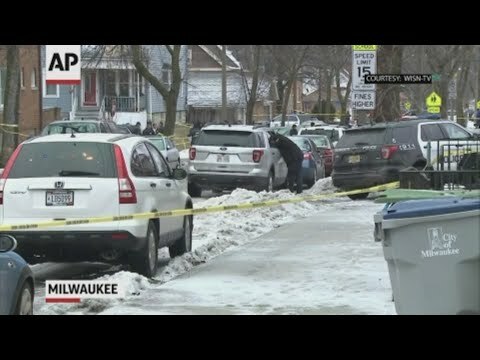 MILWAUKEE (AP) — A 17-year police veteran was shot and killed as he served a warrant on Milwaukee’s south side Wednesday, becoming the city’s third officer to be killed in the line of duty in eight months, authorities said. Officer Matthew Rittner was a tenured member of the Milwaukee Police Department’s Tactical Enforcement Unit, which was conducting a search warrant on someone wanted for illegally selling firearms and drugs, Sgt. Sheronda Grant said in a news release Wednesday night. She said officers announced themselves as police and that the suspect fired several rounds. The 35-year-old Rittner was struck by gunfire and taken to a hospital, where he died, Grant said. “Officer Rittner is the third officer we have lost in the line of duty during a short eight-month period after going approximately 22 years without a line of duty death,” Grant said in the release. Wisconsin Attorney General Josh Kaul said in a statement that he joins “all of Wisconsin in mourning the loss of one of our brave law enforcement officers. Those who put on the uniform every day put their safety at risk to protect others and to save lives.” Kaul said the state Department of Justice is assisting in the investigation, and the Law Enforcement Death Response Team is supporting the Milwaukee Police Department. Numerous officers gathered at the hospital where Rittner was pronounced dead. On Wednesday afternoon, a procession of police vehicles with lights flashing accompanied the officer’s body from the hospital to the Milwaukee County Medical Examiner’s Office, where an autopsy is planned for Thursday. Six months ago, Officer Michael Michalski was fatally shot while trying to arrest a convicted felon wanted on drug and domestic violence offenses. Last June, 23-year-old Officer Charles Irvine Jr. was killed in a squad car crash during the high-speed pursuit of a suspect. Irvine was the first Milwaukee officer killed in the line of duty since 1996. Experts say serving warrants are dangerous operations for police, primarily because the officers are entering unknown territory. Last week, narcotics police officers serving a search warrant on a house in Houston came under fire as soon as they entered the home, and five were hurt. The two suspects were killed.